PASADENA – A complaint alleging that Pasadena Police Officer Kevin Okamoto perjured himself during the investigation and prosecution of Edward Damas has been filed with the Pasadena Police Department. The complaint, received Monday, is the latest of several written complaints and signed declarations alleging gross misconduct by Pasadena officers. Attorney Michael Kraut, who along with attorney Andrew Stein filed many of the complaints against the detectives, said he was shocked at Kevin Okamoto’s punishment, which he felt was minimal. Police Chief Phillip Sanchez commissioned an investigation by LASD regarding eight complaints filed against the two officers. The allegations included claims that the officers had beaten suspects, threatened witnesses and hidden evidence. Okamoto is named in many of those complaints, which accuse Pasadena police officers of kidnapping, beating and threatening to kill witnesses. Damas’ attorney Michael Kraut has called for the Los Angeles County District Attorney’s Office to bring criminal charges against Okamoto. Pasadena police officer Kevin Okamoto illegally recorded a conversation between a man in custody and his attorney, the attorney alleged. In court documents, attorney Michael Kraut alleges Pasadena police Officer Kevin Okamoto recorded a conversation between Kraut and his client Edward Damas, a man accused of battery in the 2009 beating of a nightclub disc jockey in Pasadena. The officer also listened to the recorded conversation and passed that recording onto prosecutors. Okamoto also turned over the recordings to Karla Sarabia, the attorney for Damas’ co-defendant Steven Delossantos, according to court documents. “I think this is a police officer who is going to try to get his way no matter what’s involved, including violating someone’s constitutional rights,” Kraut said. 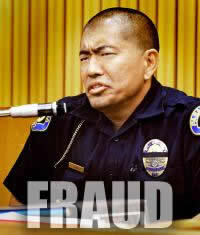 Glendale attorney Jeffrey Voll alleged Pasadena police officer Kevin Okamoto asked him for airplane tickets to Hawaii. In return, Voll claimed Okamoto promised to refrain from arresting the father of a man suspected of participating in a December 2010 stabbing at the Rose Bowl. “During our conversation, Detective Okamoto advised me that he has worked with private defense lawyers who have done him and other Pasadena law enforcement officers favors such as flying them to Las Vegas for the weekend,” Voll said in a July 23 declaration filed in Pasadena Superior Court. 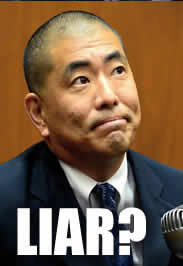 Voll filed a complaint about Okamoto with the Pasadena Police Department in April 2011. A complaint alleging that Pasadena Police Officer Kevin Okamoto perjured himself during the investigation and prosecution of Edward Damas has been filed with the Pasadena Police Department. Stein’s allegations are similar to those leveled by defense attorney Michael Kraut, who last year claimed Pasadena police Officer Kevin Okamoto failed to turn over exculpatory evidence in an attempted murder case. Okamoto had been suspended but returned to work this week when Judge Teri Schwartz cleared him of knowingly hiding evidence, City Manager Michael Beck said. Same judge Okamoto goes to for Search and Arrest Warrants, now how objective is that? Shortly after the Veritas investigation was launched, Broghamer was transferred out of homicide to the counter terrorism unit and later to patrol, Sanchez said. Kevin Okamoto has also been transferred to patrol, according to spokeswoman Lt. Tracey Ibarra. However this is not what Kevin Okamoto tells the public. Where the hell is the US Justice Department? Why don’t they do something to stop mentally ill cops? Kraut is a former Los Angeles County deputy district attorney who prosecuted the Rampart case involving serious misconduct by Los Angeles Police Department officers. He said he believes Kevin Okamoto’s actions are part of a pattern of behavior among certain Pasadena detectives. Kevin Okamoto was reassigned to patrol in February as part of what Sanchez described as a routine rotation. Neither Okamoto nor Gomez returned phone calls seeking comment. Harvey claims he has been routinely harassed by Kevin Okamoto and Gomez for close to five years. He claims Gomez threatened to kill him in 2007. Harvey claims the most recent incident of harassment came from Kevin Okamoto during a traffic stop May 7. “I hadn’t committed any traffic violations and I feel I was stopped without probable cause,” Harvey wrote in a formal complaint filed Monday afternoon at the Police Department headquarters on North Garfield Avenue.